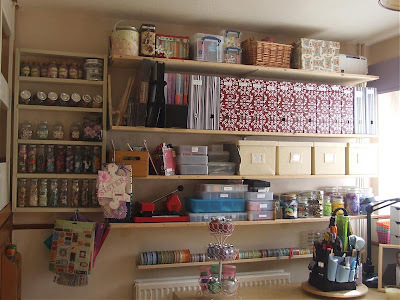 I have been trying to sort out my craft room for ages. I bought the biggest Ikea Expedit unit and an understairs unit from Argos, along with baskets to go in it. After weeks of starting and stopping, I have finally got it to how I like it. The boxes at the bottom of the Ikea unit hold my papers and cardstock along with small albums and mini books. 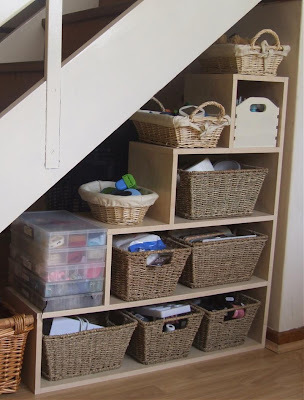 As you can see the stairs in my craft room I had to work round them. 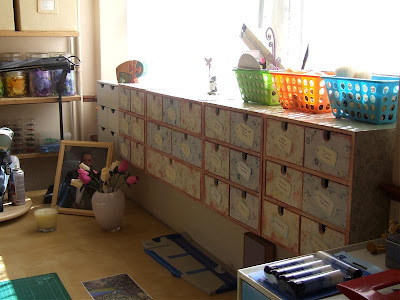 The drawers on the window sill are Ikea drawers that I decorated with freebie papers. The end one is still waiting to be done. My husband made the Prima flower unit for me. Just thought i would share my room with you all, as my husband thinks that it's a waste of space, although it's now tidy. 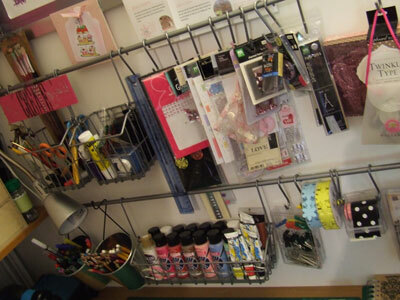 Samm shows her studio in an entry at her blog. I think those new paper racks from ebay are great! 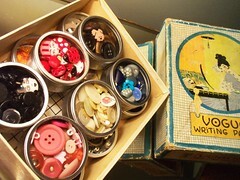 Edited to say: the big box with a bag in it is a laundry box with a recycling bag in it for all my scraps! 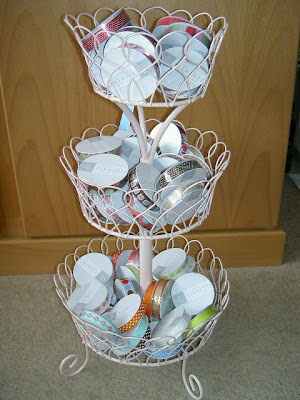 Here Susan shows how she keeps her reels of ribbon in the famous Wire Cake display. You can read about her and her work in her blog here. 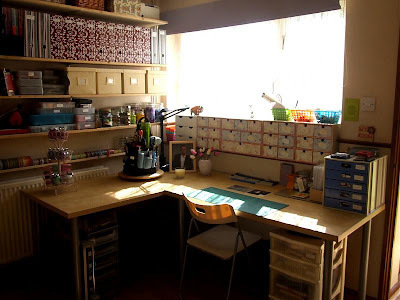 This blog is lovely, not only the scrapbookers are wonderful but also they often post an entry about the scrappers space including a layout. Todays entry is by Nic Howard. Really worth a look. I am not sure if I can post the photos from there so I'll have to ask. 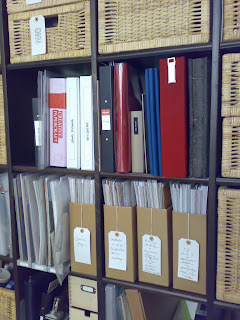 However I can tell you that in three photos shows how to store paper/cardstock, photos and the scrapping table. 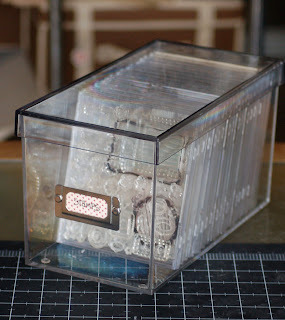 Great simple idea of storing the clear stamps in empty transparent cd cases and then those into CD storage boxes. In this case a clear one that allows you to see everything through. You can read Judi's blog here. Thanks to Lemon for finding this. 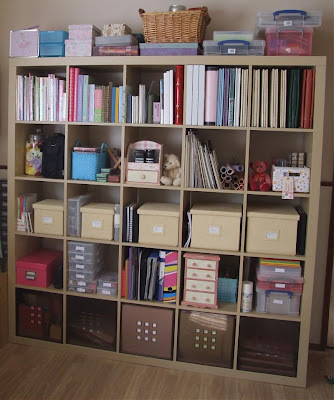 So here they go some ideas on how to store paper. 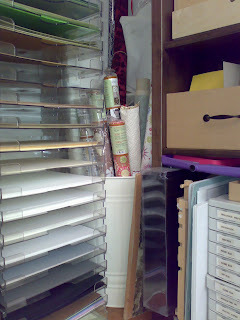 My stash of patterned papers are vertically stored in MUJI paper holders. Which look like this when empty and that you can buy them here. 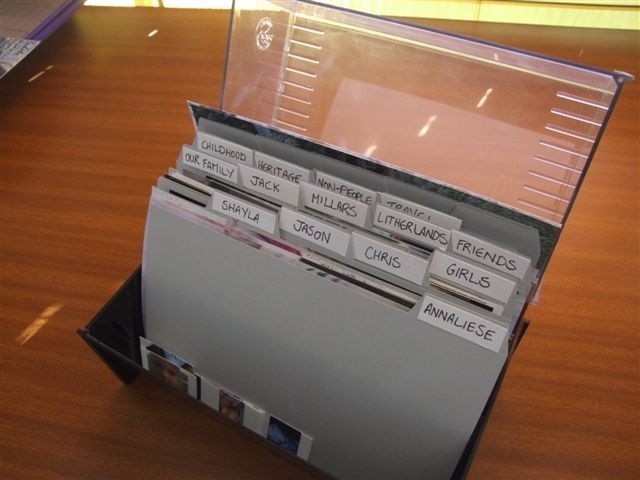 They are perfect for 12x12", they have handles which means that are easier to pop in and out of the shelf and at £6.95 per a pack of 5 holders is a bargain! Right now I have already eight of those filled with patterned paper. 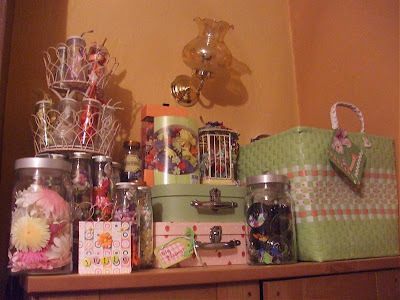 Also in the photo you can see that I have got a cream bin which holds my rolls of paper. When you love paper as much as I do, size doesn't matter, big or small, I love it. So this is how I keep some of the larger pieces of paper. This is my favorite wall in my studio. Still not perfect though. The thin shelves and almost everything else are from IKEA, of course, and at the moment I have up a total of six. Mostly they hold paper flowers and my acrylic paints dabbers. Under them Kitchen hanging rails perfect for hanging the new items I have bought,because since I sit almost in front of them it reminds me of them and so I use them. On the right hand side I have got two small and cheap drawer thingies from Homebase that are sold as a sorting system for screws and so on, which I use for sorting my buttons by colour. 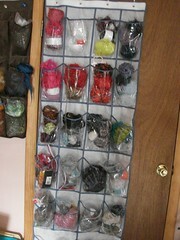 I bought the IKEA small cookie jars that i loved from day one to fit in the shelving unit. 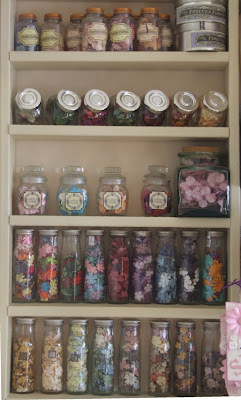 On them I put all the prima daisies by colour, love the colour splash in the wall in front of me while I am working.